And to those that are disgusted by the Cornfather’s actions in this one: You have only yourselves to blame. The feedback in the last strip really got me thinking about who would actually consume some of Mombot’s handiwork (footiwork? ), and after much consideration, all signs pointed to jefbot’s best pal. So direct any disgust or complaints at the comments section, as always. I don’t know if I’d eat that…. hey, new gravatar, Z! awWWww… baby cheetah? i dig it, Z. cute and fierce. Yeah, that might have been me….I still haven’t checked for a reply, Should probably do that soon…. Which strip was that on? Just one thing Ive been wondering about, The only other place I’ve seen that dragonfly motive on mombot’s shirt (and now the watermelon) is on Juniper lee from the cartoon. Is it an american (or japanese/italian/german heh) thing? Or are you also a fan of the cartoon? The problem doesn’t seem to be finding them. It’s finding the single ones. Yeah, there are quite a few of us that have been snatched up already. (Actually, I can’t claim gamer girl status, just geek girl). YES we Gamer/Geek Girls do exist…we are a rare breed..sort of like Pixies…or the Chupacabra! And Sadly many of us have been snapped up, hubby is elated he got his limited edition Loves Star Trek/Star Wars and video games version. Stop looking…that’s when one will fall right into your lap so to speak. But posting on here, might help! My hubby was quite happy with his “version” as well lol and we’ve already been teaching our three year old how to play too! Oh, we exist. The problem is A. Finding us, and B. Being in the same zip code. Most of the gamer/geeky guys I think I’d like are ALL down in the States. Well. Wait… where are you from?? as for the dragonfly on Mombot’s shirt: nope, no connection to Juniper Lee. dragonflies are just a thing my mom likes and collects, so it has become her character’s symbol. any similarities to Juniper’s shirt are complete coincidence. This may sound stupid, but the first thing I noticed when looking at the comic was that the symbol on mombot’s shirt was that the symbol was the same as the one from Juniper Lee’s shirt. I figured it was, but just wanted to point out that was my first thought upon reading the comic. I actually wasn’t aware it was a dragonfly, thought it was a faerie, partially cause I use it in a deck of cards I print. Just read your archives over the weekend, followed an ad from Commisioned, I think. …the secret is in the sauce! 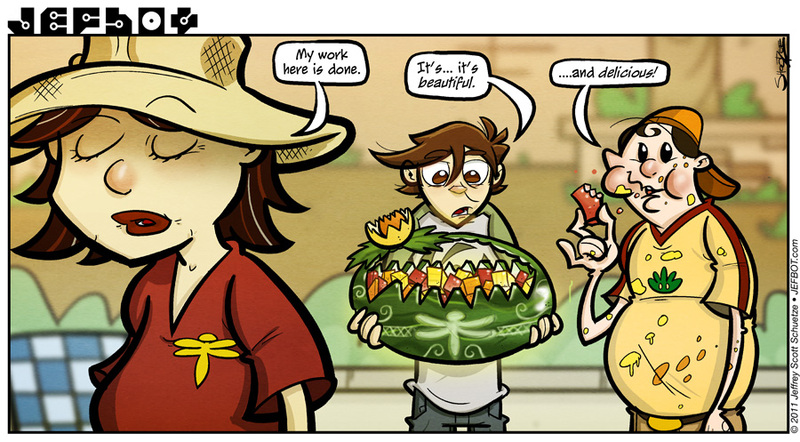 Or toe jam… Great strip as always Jefbot! I love your mom! She is adorable!! It’s the design on the watermelon itself that did it for me—your attention to detail is mind-boggling and much appreciated! Agreed. I didn’t see the dragonfly on the watermelon till my second pass over the strip. arigato, shanna! always makes me feel good when i hear people are looking at the details of the strip. i’m sure Mombot could be persuaded to give you a few lessons, shanna, but i’m afraid that a thick, dense nail with a muscled toe to support it might take years of training to acquire! *blinks*…AWESOME! Mombot proves she is my hero yet again! OMG CF! *wrinkles lil pixie nose* I’m not sure I could put that anywhere near my mouth! I love the look of awe on Bot’s face. You know he’s just beaming with a weird sense of pride. Attention to detail FTW Jeff. *puts on his Bot-ka-teer ears* Good morning, Pixie! i’ve wondered what the botketeer ears would look like, Psynapse. brown spikes emulating jefbot’s hair, perhaps? Hmmm that or hamster ears… if we can decide on an appearance I’ll make some and get a picture of myself wearing them. and i’m happy you like the detail! these big panels are fun cuz the little things are more noticeable; sometimes little flourishes get lost when scrunched into 3 or 4 panels. Judging by Cornfathrs actions AND state of his person, he needs to learn something about personal hygiene. Mombot sure is talented. Kinda makes me wonder about her halloween pumpkins and decorations. i think you’re right, Maryz – the Cornfather could definitely use some hygiene lessons. beyond eating foot-laced fruit, he always seems to get more food on his shirt and face than in his mouth, whenever we see him eating. Hi MomBot! We hear you had a fun time at Phoenix Con. we probably won’t hear much from Mombot for the next week or so, Pixie, as she and Popbot went on vacation! i can’t believe they’re off on another trip already – i’m still recovering from Phoenix! glad you dug it, Mombot! I’m too busy having a Jefbot-level reaction to the craftsmanship to have any misgivings about the Cornfather’s actions. heheh. perhaps the Cornfather’s mesmerized by the craftsmanship too, Joe, and just couldn’t resist. and jefbot’s “unsplatteredness” might just be a testament to Mombot’s watermelon carving skillz! heh. she should totally accompany the Cornfather when he gets hired for kid parties, Anime fan! That clinches it. Mombot needs her own cooking show. good idea, Striker! at the very least she should try out for America’s Got Talent. i think the definitive answer is you should do both, TCG: both applaud the skills and cower in terror. it’s the only way. But if I do both, won’t I just end up frozen in place? 1. Dragonfly motif on the melon was a nice touch. 2. I’ll believe it’s possible when I see it (clearly) on You Tube. She’d need a four-inch long toenail to perform the feats (no pun intended) decscribed in this arc. 2. it’s very possible she has a retractable toenail, Chaucer. although proving it would be difficult, as there would be much danger involved, getting close enough to the toe for verification. That’s even cooler than what I had thought of! 😀 Can’t wait to see what you have planned for the next arc. I know, when I saw the Halo 4 trailer I was like “OHMYGODOHMYGODOHMYGODYES!”, but then I saw that it wont come out until winter of 2012 and was like “F@#*!” And then I saw that Halo CE Anniversary was coming out at about the same time as Skyrim and became even more excited about November than before. Ok, you’re depth of field is so masterful I fully expect the comic to go 3-D in the near future. Shouldn’t that say Grammar Nazi? thanks for the kudos, Tim! y’know, since i keep all the elements of my panels on different layers, i bet it wouldn’t be hard to 3D-ify it in the future. and if i ever animated the strip, doing a simulated rack focus would be pretty easy, too. Heh it’s not that I should stop looking since I never did. It’s more a case of hoping they come out of the woodwork so to speak. I’m south african (look on a map, it’s south of europe 😉 ) Our gaming culture is a bit behind (only a little) and while we are up to date with games and most consoles, there is still a retarded culture of childish bad mouthing of girl gamers. I tend to punch the retards in the face if they’re not *actually* children. yeah, there’s a lot of bad mouthing of girl gamers (and really any gamers) on both the 360 and PS3’s online networks. it’s just kinda the way it is, and from what you’ve described, it sounds like it’s a universal problem. sad. that kinda thing should really be unacceptable. and the Juniper Lee symbol is totally coincidental – Mombot just happens to like dragonflies. Why is it that I am oddly made hungry after having eaten before reading this strip? What HAVE you done to me Bot? of course, reading that you’re hungry has made me hungry now. but i think i’m going to stay away from fruit at the moment. i think both reactions would be entirely appropriate, jiro. I would totally eat some of that. ha! grab a fork, Aelyrin! Hey ‘bot, I figure I should let you know – there’s a double up on the “Previous page” buttons on the front page for the comic, with one heading back one comic, and one heading back to axis powers, same as the first comic button. I don’t know if it’s just me, or universal, but it’s occurring. I’ll second you on that dude, can be a might annoying at times. I had put it down to a combo of Kubuntu and the browsers i use (Chrome and Firefox). if i don’t update the site soon, i might just get my web guy to take a look at the code, Deaconvorbis. gotta be something messed up there. thanks for the heads-up, Churba. i’ve gotten this complaint before, but i can’t replicate it on my Mac. i also don’t know if i’d be able to fix it, even if i could see it. i’ve been thinking about completely revamping the site lately, tho, so if that happens, it should wipe out that bug. No worries, ‘bot. Seems to be common on Windows in Firefox and chrome, but I can’t get to a mac to see if it happens on there. It does only occur on the frontpage, though, not the archive pages. It’s not a huge problem, and it’s probably something easy to miss, like an extra slash or something in your comic navigation code inside the li tags. Hahah you used my twisted little idea… hey I’d at least try it. Food poisoning is curable, right? Haha yes! I will visit and enjoy her podiatric proliferations… and I guess it’s a good thing that we’re on the same wavelength. Things got pushed back with the start of a new job but I’m starting a new webcomic… possibly two. yeah, the Cornfather got “juiced” when Mombot was being all Fruit Ninja, MrSnow, although with the way he eats, he probably would’ve gotten it all over himself anyway. heheh. and jefbot has acquired some of Mombot’s feet-skillz, as evidenced here, but he’s still the padawan to her jedi. with her ‘monkey feet’ I’m surprised you didn’t have cornfather toss in a banana… only to watch her peel it andor eat it cornfather eat’s it hehehe. hmm… i’m not familiar with “Vegetable samurai,” Bruudwin, but now i’m gonna have to check it out! Now THAT is art! It is not disgusting since I know that mombot cleaned her feet before cutting…she did…right? i do like he look of the watermelon though. I wish Mombot could really do that. I would vomit if the artistry and facial expressions weren’t so amazing. Watermelon salad can satisfy everybody needs for sweet diet.